I have five cards of Jack Brohamer. This one is from 1980 Topps. 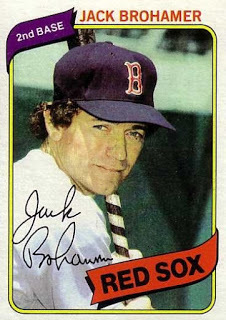 Playing career: Second baseman Jack Brohamer played for the Indians, White Sox and Red Sox from 1972 to 1980. In 805 games he hit .245 with 30 HR and 227 RBI. A fuller account of his career can be found at the 1974Topps and 1980 Topps blogs. Where he is now: A retired police sergeant from Oceanside, CA. Google Autocomplete results: He is first when you type Jack Broh, ahead of Jack Brohman, an auto racer. There do not appear to be any other prominent Jack Brohamers. Coming up next: The next profile will be Dave Bromberg. I have 64 cards of Rico Brogna. This one is from 1998 Upper Deck. 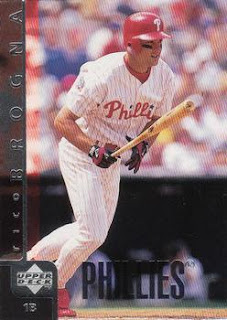 Playing career: First baseman Rico Brogna played nine seasons in the major leagues, mostly for the Mets and Phillies. In 848 games he hit .269 with 106 HR and 458 RBI. He topped 20 homers in four different seasons and led the National League with 10 sacrifice flies in 1998. A fuller account of his career can be found at The Greatest 21 Days. Where he is now: He started the 205 season as player information coach for the Angels, and took a leave of absence when he was diagnosed with testicular cancer in May. He returned to the team in June, but in July was reassigned to the pro scouting department after GM Jerry DiPoto was fired. Google Autocomplete results: He is first when you type Rico B, ahead of Rico Brooklyn, a lighting store in Gowanus. There do not appear to be any other prominent Rico Brognas. Coming up next: The next profile will be Jack Brohamer. I have one card of Brian Broderick, from 2011 Topps. Playing career: Brian Broderick pitched in 11 games for the Nationals in 2011, going 0-1 with a 6.57 ERA. Where he is now: Broderick pitched last season in the Royals organization at AAA Omaha, going 5-4 with a 2.90 ERA. He is not with a team in 2016. Google Autocomplete results: He is second when you type Brian Brod, between Brian Brodersen, a pastor, and Brian Broderick LinkedIn, which refers to an editor at Bloomberg BNA. Another prominent Brian Broderick was recently on the NYU track and field team. Coming up next: The next profile will be Rico Brogna. I have four cards of Tarrik Brock. This one is from 1992 Upper Deck Minors. Playing career: Outfielder Tarrik Brock played twelve seasons of professional baseball, making the major leagues with the Cubs in 2000. In 13 games with the Cubs he got two hits in twelve at bats. In 1,319 minor league games he hit .243 with 78 HR, 495 RBI and 213 SB. 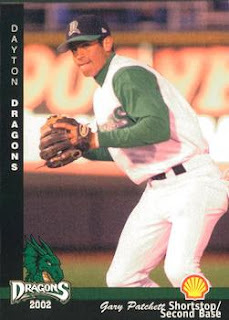 Where he is now: Minor league outfield/baserunning coordinator for the San Diego Padres. 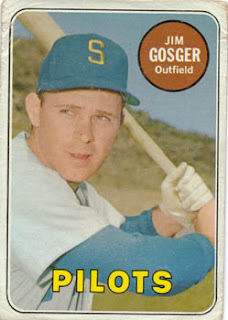 My memories: He shared his thoughts on baseball cards with this blog in 2010. Google Autocomplete results: He is first when you type Tarrik, ahead of Tarik Black, a center for the Los Angeles Lakers. There do not appear to be any other prominent Tarrik Brocks. Coming up next: The next profile will be Brian Broderick. 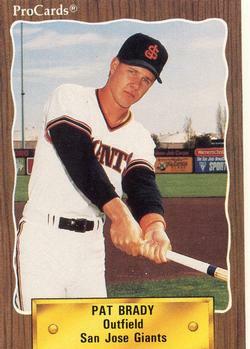 I have one card of Russell Brock, from 1991 Stadium Club Dome. 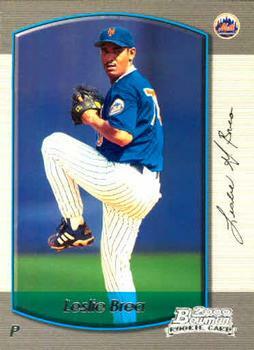 Playing career: Russell Brock pitched in the A’s and Yankees organizations from 1991 to 1996. In 116 games he went 29-36 with a 4.15 ERA. Where he is now: Anyone know where Russell Brock is now? Google Autocomplete results: He is first when you type Russell Broc, ahead of Russell Brockel, a retired teacher in Minnesota who recently passed away. The first entry when you google Russell Brock is not the ballplayer but the head coach of the LSU Sand Volleyball team. Coming up next: The next profile will be Tarrik Brock. I have one card of Norman Brock, from 1989 Best. 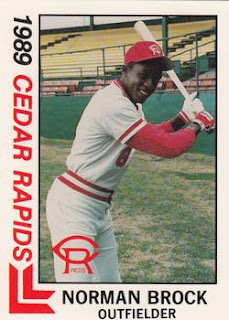 Playing career: Outfielder Norman Brock played in the Astros and Reds organizations from 1984 to 1989. In 647 games he hit .274 with 20 HR, 195 RBI and 120 SB. Where he is now: Anyone know where Norman Brock is now? Google Autocomplete results: He is second when you type Norman Broc, between Norman Rockwell and Norman Rockwell Museum, both of which refer to the painter. There are no references to the ballplayer on the first page of Google results; most refer to a playwright named Brock Norman Brock. Coming up next: The next profile will be Russell Brock. I have two cards of Lou Brock. This one is from 1979 Topps. Playing career: A member of the Baseball Hall of Fame and the 3000 hit club, Lou Brock is the former all-time and single-season stolen base champion. In his nineteen-year career he was a six-time all-star and earned MVP votes in ten different seasons, finished second in 1974. His 938 stolen bases are currently second all-time. He was also one of the best World Series performers of all time. In 21 games he hit .391 with 4 HR, 13 RBI and 14 SB. Where he is now: He has been a successful businessman in various fields, including flowers, airport retail concessions, child safety and mobile marketing. He owns two patents for the “Brockabrella” umbrella hat. He is also active in many charitable endeavors, including spreading awareness about diabetes management, an area he is personally familiar with having been diagnosed with the disease over fifteen years ago, and which caused him to have his left leg amputated in November. Interesting facts: His son Lou Brock Jr. was a defensive back in the NFL in 1987 and 1988 with the Chargers, Lions and Seahawks. Google Autocomplete results: He is second when you type Lou B, between Lou Bega, a mambo musician, and Lou Barlow, an alternative rock musician. Another prominent Lou Brock is a ballroom dancer. Coming up next: The next profile will be Norman Brock. 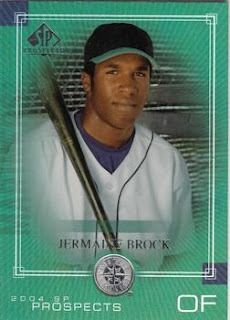 I have one card of Jermaine Brock, from 2004 SP Prospects. Playing career: SP put out a Prospects card of JermaineBrock because he hit .353 over his first dozen minor league games in 2004. They jumped the gun a little bit – at the end of the season he was down to a .242 average in 35 games. He was suspended for not showing up to start the 2005 season – one Mariners blog claims he “decided he liked playing XBox better than baseball.” He did come back two years later but put up only a .222 average in 57 games. 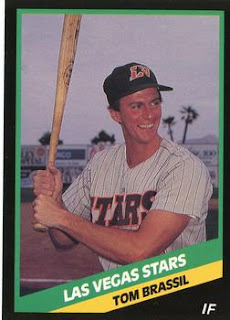 Easily one of the worst pro careers for someone with a nationally-produced baseball card. Where he is now: Anyone know where Jermaine Brock is now? Google Autocomplete results: There are no autocomplete entries for Jermaine Brock. Most entries on the first page of results refer to Tramaine Brock, cornerback for the 49ers. Coming up next: The next profile will be Lou Brock. 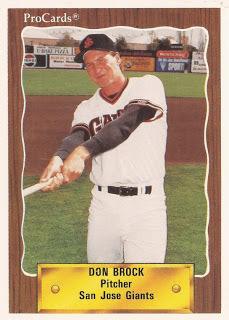 I have one card of Don Brock, from 1990 ProCards. Playing career: Don Brock pitched in the Giants organization from 1988 to 1990. In 67 games he went 3-6 with 3 saves and a 3.68 ERA. A fuller account of his career can be found at The Greatest 21 Days. Where he is now: He works at Duke Energy’s Oconee Nuclear Station and is also a youth baseball coach. Google Autocomplete results: He is fifth when you type Don Broc, between Don Broco You Wanna Know and Don Broco Automatic Lyrics, both of which refer to a singer. There are no entries for the ballplayer on the first page of Google results; most are for the founder of Astec Industries. Chris Russ pitched in the Rangers organization from 2000 to 2004. In 59 games he went 12-6 with a 3.07 ERA. Now a Realtor at Keller Williams in Columbia, MD, he kindly answered my questions about baseball cards by pointing out an error on one of his cards. "I was told once I have a Bowman error card out there somewhere." Thanks! The card is actually 2001 Topps, which lists his birth month as November instead of October. I have one card of Phillip Britton, from 2007 Bowman Chrome Prospects. His first name is misspelled on the card. Playing career: Catcher Phillip Britton played in the Braves organization from 2005 to 2009, and the Orioles organization in 2010. In 328 games he hit .259 with 25 HR and 132 RBI. Where he is now: Owns Britton’s Bullpen in Olney, IL. Google Autocomplete results: He is fifth when you type Phillip Britto, between Philip Britton Dermatology, a doctor in Florida, and Philip Britton Bolton School, a headmaster at a British school. The first entry when you google Phillip Britton is not the ballplayer but a disgraced former choirleader. Coming up next: The next profile will be Don Brock. I have one card of Lewis Brinson, from 2013 Topps Pro Debut. Playing career: Outfielder Lewis Brinson was the Rangers’ first round draft pick in 2012 and has moved quickly through the organization. In 2015, at the age of 21, Brinson hit .332 with 20 HR and 69 RBI at three different levels, including a .433 batting average in eight games at AAA. Where he is now: Going into the season as one of the best prospects in the Rangers organization, he has started 2016 at AA Frisco where he has struggled a bit, hitting .237 with 4 HR and 21 RBI in 35 games. Google Autocomplete results: He is second when you type Lewis Br, between Lewis Brass, a tubing company in Queens, and Lewis Brisbois Salary, referring to a law firm. Another prominent Lewis Brinson is a communications director at Boeing. Coming up next: The next profile will be Phillip Britton. 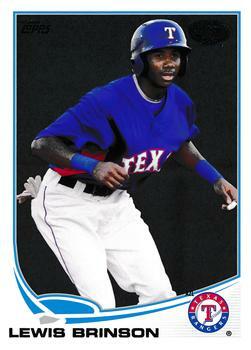 Outfielder Leland Macon played four seasons in the Rangers organization. In 400 games he hit .251 with 11 HR, 138 RBI and 69 SB. Now an Associate Financial Representative at Northwestern Mutual and a volunteer coach for the St. Louis Gamers, he kindly answered my questions about baseball cards. "The 1994 Bowman card is the favorite of myself. My kids still can not believe how young I look! I don't actually have a card, but both of my sons, my wife and mother have a few. A few years ago we held a fundraiser for our baseball team to go to Cooperstown, and the kids found my cards online and auctioned them off...I think we made 20 bucks! I was embarrassed, but great for a laugh! My boys are always looking at the projected stats on the back of the card and asking if I was really that fast of a runner. Growing up my favorite cards were of any St. Louis Cardinals players. I used to build my collection, one pack at a time. I never got the card boxes, so I had to be very strategic and selective with my trading activities. I don't still collect cards...I figured with the internet, trading cards were almost obsolete." Infielder Gary Patchett played eleven seasons in the Reds and Angels organizations. In 740 games he hit .239 with 15 HR and 93 RBI. Now an Area Scout for the Seattle Mariners, he kindly answered my questions about baseball cards. "It's always pretty cool to see some of your old cards from back in your playing days. When I first started scouting I would occasionally get approached in the stands to sign cards during the game. I thought it was pretty cool but also wondered how the heck someone actually knew who I was or even had an old baseball card of me. I like all of the cards that I have of myself. I guess when you see them, it takes you back to a time in your life where you were doing the one thing that you had always dreamed of as a kid growing up, playing professional baseball. I had a card collection when I was younger, with boxes and boxes of cards. I had a book with the better cards and then I would sort the rest of them out by teams. I actually just looked at some old cards and it was pretty cool to see some cards of ex managers, hitting coaches, pitching coaches and now scouts who I have crossed paths with over the course of my time in professional baseball. I guess when you are a kid you just collect them but now to get to know them and the impact that they had on your baseball career, it's pretty awesome." I have one card of Zach Borenstein, from 2014 Bowman Prospects. Playing career: Outfielder Zach Borenstein was drafted by the Angels in 2011 and played three seasons in their organization before being traded to the Diamondbacks in 2014. In 2013 he hit .337 with 28 HR and 95 RBI in A ball; in three seasons since at AA and AAA he has struggled to put up similar numbers. 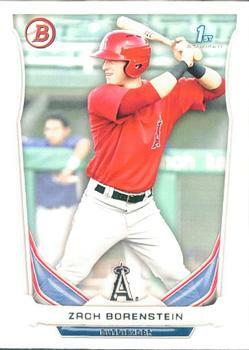 Where he is now: In 33 games at AAA Reno, he is hitting .247 with 2 HR and 15 RBI. Google Autocomplete results: He is third when you type Zach Bor, between Zach Borichevsky, an opera singer, and Zach Boren, who was a fullback at Ohio State. There do not appear to be any other prominent Zach Borensteins. Coming up next: The next profile will be Lewis Brinson. 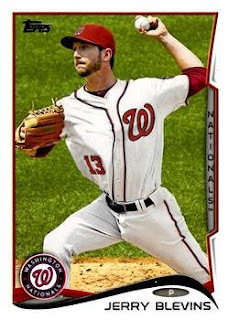 I have one card of Jerry Blevins, from 2014 Topps. Playing career: Jerry Blevins is in his tenth season as a major league middle reliever. He spent seven seasons with Oakland before moving to the Nationals in 2014 and the Mets in 2015. In 369 games he is 17-9 with a 3.50 ERA. Where he is now: In seventeen games with the Mets this season he is 1-0 with a 2.79 ERA. Yesterday he pitched a scoreless 0.2 innings in a loss to Colorado. My memories: I remember him vaguely pitching over the last few years but nothing specific. Google Autocomplete results: He is fourth when you type Jerry B, between Jerry Baker, a gardening supplies retailer, and Jerry Butler, a singer. Another prominent Jerry Blevins is an attorney in Alabama. Coming up next: The next profile will be Zach Borenstein. A rookie card of Brendan Ryan before he started sporting extreme facial hair styles to draw attention away from his atrocious hitting. I had never had a card from 2015 Finest before - nice card of a nice player. This gold parallel is numbered to 2008. Got an awesome package today from the blogosphere's most generous man, David of TribeCards. It had all the cards from the 2014 giveaway as well as the first batch from this years! So much cool stuff in here. The 2014 giveaway was done by player, meaning if you drafted a player you got all of their cards pulled during the year - which can really highlight Topps's occasional lack of creativity. But it also shows something I didn't realize - that the base set and opening day set sometimes have different photos. I believe they are usually the same? I still don't have any base Topps cards from 2016, but thanks to this giveaway I do have my first 2016s. I may be the only blogger who actually likes the new Donrusses. They are similar enough to the eighties, but not the same, so I can imagine myself being a kid in that era again and seeing a new card design for a new year. My first Topps's from 2016 come not from the base set but from Gypsy Queen! I'll end off with Ivan Nova, who pitched a great game today to shut down the White Sox. First baseman Tony Clark played fifteen seasons in the major leagues, predominantly with the Tigers. An All-Star in 2001, he topped 30 home runs three times and finished his career with 251 HR and 824 RBI. Now the Executive Director of the Major League Baseball Players Association, he kindly answered my questions about baseball cards. I recall having a card of myself holding a sign with my name on it, as well as a card that had me playing 1st as a left-handed 1st baseman. Beyond that, I also remember, when I was about 8-9 years old, my family was having a garage sale and I wanted to sell something, too. As a result, I ended up selling two shoe boxes full of baseball cards! To this day, I have no idea if there was anything of real value among the lot, but I know now that they were likely worth more than the $5 I received! No favorites. We rarely received cards from the manufacturers themselves, so anything I have is the result of fans sending them to me. That also means that I have very few (if any) cards from other Players. Unfortunately, I gave my heart and soul away at the garage sale 35 years ago! Thanks! 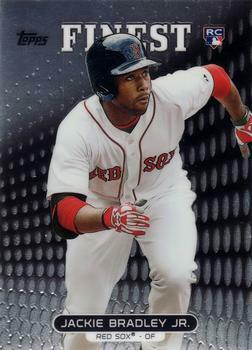 The card where he appears left-handed is from 1997 E-X2000, a see-through card which featured the reverse of the front image on the back, but with the uniform altered to not look backwards. I could not find a card of him where he is holding a sign with his name - any ideas? Here is a card of him from my collection. Picked up another little bag yesterday from the guy who sells cards on 37th street. He says he's still working on one more big box for me, maybe finished next week. Meanwhile I still get these slightly higher-end bags pass the time - they are kind of fun though this one had a little less in terms of really stand-out cards. I don't normally get New York team cards from him so I was glad to see a Yankee card that I actually needed. 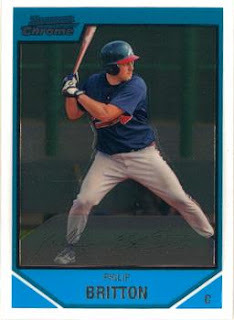 The 2005 Bowman's often lose the background completely in the transition to Chrome resulting in a nice mirror effect. Another card with a nice mirror effect; this is an insert from 1998 Topps. I have two cards of Leslie Brea. This one is from 2000 Bowman. Playing career: Leslie Brea pitched in eight games for the Orioles in 2000 and 2001. He went 0-1 with a 12.27 ERA. Where he is now: Assistant coach at Desert Edge High School in Goodyear, AZ. Google Autocomplete results: He is tenth when you type Leslie Bre, behind Leslie Bream, a district manager at Mondelez. There do not appear to be any other prominent Leslie Breas. 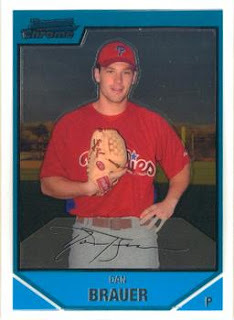 I have one card of Dan Brauer, from 2007 Bowman Chrome Prospects. Playing career: Dan Brauer pitched in the Phillies organization from 2006 to 2009. In 92 games he went 12-14 with a 4.68 ERA. Where he is now: Wealth Strategy Associate at UBS in Dallas. Google Autocomplete results: He is fourth when you type Dan Brau, between Dan Braun Cintas, the company’s SVP for operations, and Dan Braun Department of Justice, referring to an attorney in the Criminal Division. The first entry when you google Dan Brauer is not the ballplayer but leader of the band Leche de Tigre. Coming up next: The next profile will be Leslie Brea. Outfielder Jim Gosger played ten seasons in the major leagues for the Red Sox, A's, Pilots, Mets and Expos. In 705 games he hit .226 with 30 HR and 177 RBI. He kindly answered my questions about baseball cards. 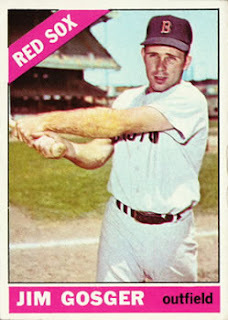 "My favorite baseball card was my Red Sox card. I also enjoyed my Kansas City card and the Seattle Pilot card because of the colors we wore." I have one card of Tom Brassil, from 1988 CMC. Playing career: Infielder Tom Brassil played seven seasons in the Padres organization. In 705 games he hit .278 with 31 HR and 277 RBI. Where he is now: Anyone know where Tom Brassil is now? Google Autocomplete results: He is second when you type Tom Brass, between Tom Brass, a political science professor at the University of Cambridge, and Tom Brassell, President of Brassell Design Consultants in Chicago. The first entry when you google Tom Brassil is not the ballplayer but an editor at Cutters. Coming up next: The next profile will be Dan Brauer. 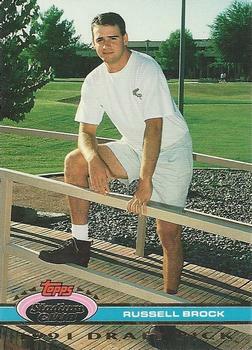 i have one card of Pat Brady, from 1990 ProCards. Playing career: Outfielder Pat Brady played in the Giants, Phillies and Tigers organizations from 1988 to 1994. In 754 games he hit .236 with 50 HR and 311 RBI. Where he is now: Anyone know where Pat Brady is now? Google Autocomplete results: He is tenth when you type Pat B, behind Pat Benatar We Belong, a song. There are no entries for the ballplayer on the first page of Google results; most refer to Roy Rogers’s sidekick. Coming up next: The next profile will be Tom Brassil. First baseman Jamie Dismuke played nine seasons of professional baseball, mostly in the Reds organization. In 793 games he hit .277 with 94 HR and 429 RBI. His best season was 1993, when he hit .306 with 20 HR and 91 RBI for AA Chattanooga. Now the hitting coach for the Birmingham Barons, AA affiliate of the White Sox, he kindly answered my questions about baseball cards. "I have no baseball card stories of my own, my favorite stories come from interactions with the fans who ask me to sign my cards and tell me their stories from a game I played in, or even coached. I love to hear stories of how we met "back in the day". 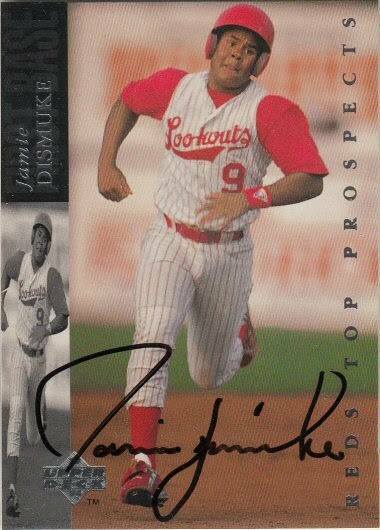 My favorite card is my Upper Deck Chattanooga Lookouts card - The one of me flying around the bases. LOL Not only because I have a look of pure determination but because of the honor of having "Reds Top Prospects" on the front. And I wouldn't say I am a card collector, but my fiancée Toni has quite a large collection of baseball cards from over 25 years. She even has a collection of all of my cards LOL. And, since I'm blessed to be working with a lot of the top prospects in the game today, we save the team sets each year to pass on to my son, James Jr. one day." I have one card of Michael Brady, from 2012 Bowman Prospects. 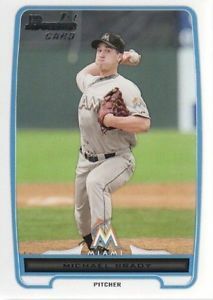 Playing career: Michael Brady was drafted by the Marlins as a third baseman in 2009, but switched to the mound the next season. Between 2011 and 2013 he put up solid numbers as a closer, saving 63 games in that span. Despite excellent numbers at AA in 2013 (2-2, 23 saves, 1.53 ERA), at age 26 he was not considered a prospect and was put on waivers, where he was claimed by the Angels, for whom he has mostly pitched at the AA level. For AA Arkansas in 2015 he was 7-7 with a 3.77 ERA as the Angels converted him to a starter. Where he is now: He signed with the Nationals organization for 2016 but has started the season on the disabled list. Google Autocomplete results: He is eighth when you type Michael Bra, between Michael Braun, an actor, and Michael Brauer, a music producer. The first entry when you google Michael Brady is not the ballplayer but the Chief Technology Officer at AIG. Coming up next: The next profile will be Pat Brady. 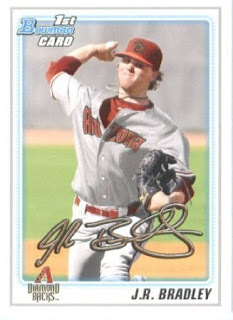 I have one card of J.R. Bradley, from 2010 Bowman Draft Picks & Prospects. Playing career: J.R. Bradley was the Diamondbacks’ second-round pick in 2010. He struggled mightily as a starter in his first three years in pro ball, going 14-31 with a 5.52 ERA, striking out 188 batters in 314.2 innings.. He was converted to a reliever in 2013 and has shown improvement over the past three years, going 8-12 with a 4.57 ERA, but striking out 148 batters in 134 innings, so there is a chance he won’t be a total bust after all. Where he is now: After a strong 2015 at Visalia (1-4, 3.37 ERA) he finally made it up to AA in his sixth minor league season, going 0-0 with a 6.75 ERA at Mobile before hurting his shoulder, an injury he is still rehabbing at the beginning of the 2016 season. Google Autocomplete results: He is second when you type J.R. Bra, between J.R. Bray, an animator, and Jr Brainpop, an educational movie. There do not appear to be any other prominent J.R. Bradleys. Coming up next: The next profile will be Michael Brady. Player Profile: Jackie Bradley Jr. I have three cards of Jackie Bradley Jr. This one is from 2013 Finest. Playing career: The Red Sox’ first-round pick in 2011, outfielder Jackie Bradley Jr. struggled in his first full major league season in 2014, hitting .198 with 1 HR and 30 RBI in 127 games. Bradley showed some improvement in 2015. In 74 games he hit .249 with 10 HR and 43 RBI. Where he is now: He is off to a good start in 2016, hitting .274 with 1 HR and 13 RBI in 24 games, with an AL-leading four triples. On Sunday he went 1-3 with a walk and a stolen base against the Yankees. My memories: One of many recent highly-publicized Red Sox phenoms, he doesn’t seem to be quite as good as his “B” teammates Betts and Bogaerts. Google Autocomplete results: He is second when you type Jackie B, between Jackie Brown, a 1997 movie, and Jackie Basketball Wives, the wife of former Laker Doug Christie. There do not appear to be any other prominent Jackie Bradleys. Coming up next: The next profile will be J.R. Bradley. I have one card of Jose Ascanio, from 2006 Bowman Chrome Prospects. Playing career: Jose Ascanio pitched for the Braves, Cubs and Pirates from 2007 to 2011. In 43 games he went 1-3 with a 5.28 ERA. Where he is now: In 2015 he pitched at Oaxaca in the Mexican League, going 3-5 with 16 saves and a 3.09 ERA. He pitched for the Leones de Caracas in the Venezuelan Winter League; don’t know if he will be pitching in Mexico again this year. Google Autocomplete results: He is second when you type Jose Asc, between Jose Ascencio and Jose Ascencio-Ibanez, both of which refer to an Assistant Professor of biochemistry at North Carolina State. There do not appear to be any other prominent Jose Ascanios. Picked up another $3 street bag my guy put together for me while he's still in the process of assembling a larger box. Like the first bag, this one was a variety of chrome and other somewhat high-end cards. (No autographs this time). There were about sixty cards in the bag. About half were baseball, and about half of those were Colorado Rockies of various kinds. I was going to post this great Charlie Hayes face-mask card even before Johnny's Trading Spot posted it yesterday. There were lots of recent chrome cards, including a few 2014 Topps.